We're back from vacation! For the next week, I'll be posting every day about the yumminess I made and/or found on our travels. Enjoy! I’ve written a lot about how I’m obsessed with the America’s Test Kitchen Family Baking Book. When I first bought the book, I only had eyes for one recipe: Raspberry Chiffon Pie. I’d been plotting, waiting, and dreaming for the perfect opportunity to make it. 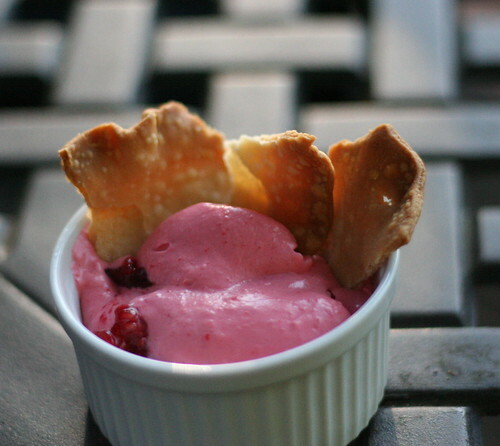 This past week, when we were at our friends’ lake cabin and had nothing but time and hungry friends, the stars were aligned for raspberry chiffon. Well, as I’m quickly learning, my grand plans don’t always go quite right. Since I wasn’t in my own familiar kitchen, and we were miles and miles from civilization (aka grocery store), I decided to cheat and use store-bought pie crust. 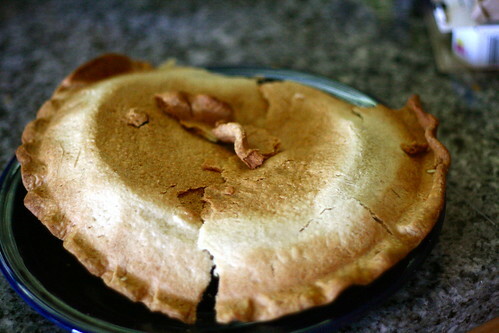 Pie crust terrifies me anyways, since I’ve never had success with it, and this time around was no different. I bought pre-made Pillsbury pie crust that came with 2 crusts in the box, and I’ll spare you the details, but it wasn’t pretty. Fail #2 could have been salvageable, but I went with my gut and set it aside. Instead of making a pie, I decided to place the layers of pie filling in a bowl instead of inside the pie crust, and served it in individual ramekins as a pudding/chiffon/mousse type of dish, with… get this… pie crust chips! One of the finer ideas to come out of my brain recently. It was such a huge hit, and everyone agreed that it’s better as an eat-with-a-spoon dessert rather than a pie. This way, you can control how much crust you want, depending on your tastes. It’s also fun to scoop the filling up with the pie chips, like a chip and dip situation. I also omitted the whipped cream layer. The chiffon layer is quite creamy, and it definitely didn’t need it the extra cream, although I can see how it would be nice on an actual pie. This was a great example of a potential failure turned into a huge success! 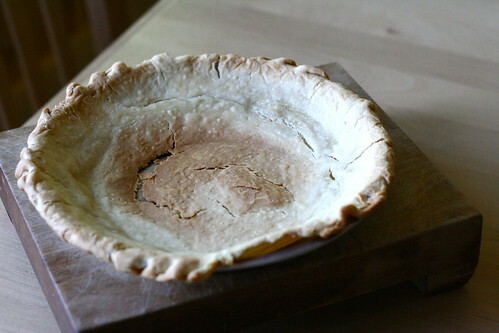 I also feel like I learned a lot with each crust mistake, and am planning on tackling pie crust from scratch again this summer using the recipe from the ATK book (a lattice pie perhaps?!). Oh, and for the record, here's what it was *supposed* to look like. Oh well! 1. Prepare a pie crust according to package directions, or make your own from scratch using your favorite recipe. 2. For the fruit layer: Cook the frozen raspberries in a medium saucepan over medium-high heat, stirring occasionally, until the berries begin to release their juice, about 3 minutes. Stir in the pectin and bring to a boil, stirring constantly. Stir in the sugar and salt and continue to boil, stirring constantly, until slightly thickened, about 2 minutes. Strain the mixture through a fine-mesh strainer into a medium bowl, pressing on the solids to extract as much puree as possible; discard the solids. 3. Transfer 1/3 c. of the raspberry puree to a small bowl and cool to room temperature. Gently fold the fresh raspberries into the remaining puree, then spread the mixture along the bottom of a medium bowl, using a rubber spatula for evenness if necessary. 4. For the chiffon layer: Dissolve the gelatin in the boiling water in the bowl of a stand mixer. Add the softened cream cheese and remaining 1/3 cup raspberry puree and beat with an electric mixer on high speed until smooth, about 2 minutes. Add the heavy cream and beat on medium-low until incorporated, about 30 seconds. Increase the mixer speed to high and beat until very thick, 1-2 minutes. Spread the chiffon evenly on top of the fruit. Cover loosely with plastic wrap and refrigerate until the filling is chilled and set, about 3 hours. 5. Break up the pie crust into chips or crumbs. Once set, spoon filling into individual bowls or ramekins and top with pie crust chips or crumbs. Serve with whipped cream if desired. Enjoy! I absolutely love this idea and frankly, I think your presentation looks even more delicious than what it's supposed to look like. I just love it. I think I'd start doing it on purpose! Welcome back! I hope your vacation was a blast. As a raspberry-lover this pie (and un-pie) look wonderfully delicious but I have to ask if the raspberry gelatin is really necessarry. Isn't there any other way of making the chiffon? I'm only asking because I don't think I'll be able to find it in my country. @waruji Glad you stopped by! This was the first time I tried chiffon, and I don't know much about the typical ingredients. 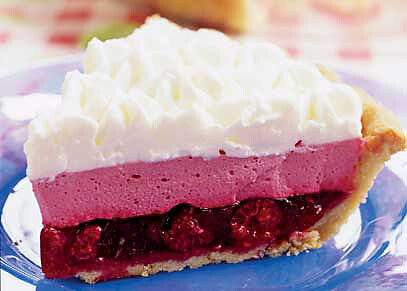 I'm going to refer you to foodblogsearch.com; try searching for raspberry chiffon recipes there. It's my favorite resource for finding alternatives to existing recipes! Sorry I don't have a more helpful answer for you :) Good luck!